This is a photo of Emmerson and Hortense Sapp. Emmerson is said to be the son of Mungeon Sapp, but I have yet to find any proof of that. 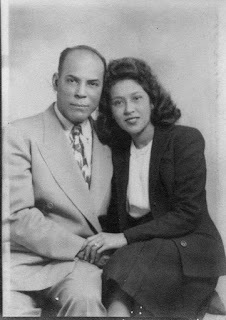 However, he was at the funeral service of my great-grandfather, Street Turner Sapp, along with his sister Jennie Sapp. I am steadily searching the census records, but have yet to come up with anything. I have been told that Emmerson donated his body to UCLA upon his death, so maybe I can find some information there. For quite sometime nobody could tell me much about Emerson, but I knew that he lived in Los Angeles because my cousins Elverne and Ella knew them. Above in the group picture, which was taken the day of Street Sapp's funeral, Emerson is there with his sister Jenny in the back row, 2nd from the right. I had seen this picture many times as well as the picture of the couple above, not knowing that it was Emerson and his wife Hortense. These photos belonged to my grandmother and she just always said that they were he cousins. It was not until when I decided to go to look for the black society newspaper that I was able to come up with a few things. To me they look like they were professional and that they would have been involved in community affairs. I discovered that the paper in the area was The Los Angeles Sentinel. I later discovered that the archives was housed at the USC library where I went to do some research. I then discovered why I was not able to find anything on Emerson, because his name was Walter Emerson Sapp. That was a revelation, and the family only called him Emerson so they did not seem to know that his first name was Walter. After discovering the name I was able to locate lots of information. First the information I found at USC was great, here is a link to view this information for Walter Emerson Sapp. I did call UCLA to see if Emerson's body was actually donated to them for research, but they told me that they could not give out that kind of information, but if I were to get a copy of his actually death certificate it would state on the certificate whether his body was donated or not. 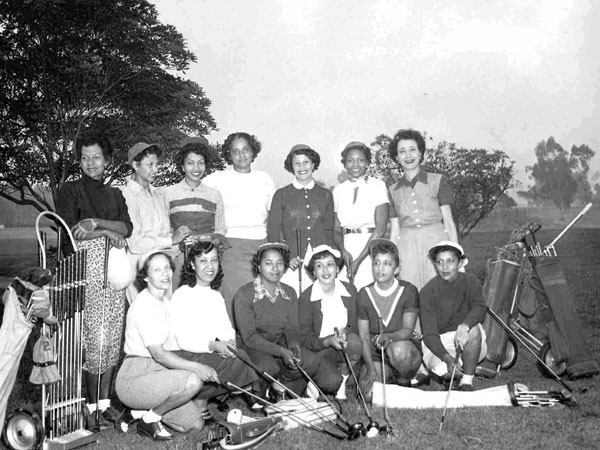 Another beautiful discovery was that his wife Hortense was a professional golfer with the Vernondale Womens Golf Club of Los Angeles, that was established in 1947. Yes a Black Womens Golf Glub. Here is a 1952 photo with Hortense Sapp in the first row center with the white visor on her head.